The system automatically checks your profile for new uploads. When you post a new video, it will automatically start receiving Comments from us in about 5-30 minutes! This service automatically, starts immediately after ordering. Instagram Comment Random! 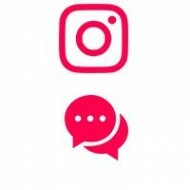 Who does not want tons of Instagram comments? Everyone does, and knows that more commenters on your profile make the latter more popular. People's interaction gives you an opportunity to begin a dialogue with your followers and build a steady social proof at the same time. Some users, however, prefer cheating and try to get comments not quite fairly. Such people use cheap tactics to make their accounts seem more popular. Very often they insistently ask you to tag your friend especially when they don’t feel like doing it by themselves. So what are the methods we need to know in order to get more Instagram comments and remain attractive all the while. First of all you may keep track of the time you are making a post in Instagram. It is evident that those posts that are made at prime time will get much more popularity than those that are seen at 3 in the moing. And that refers both to immediate posts and far seeing strategies. You can try to post immediately after 6 pm and will see at least 200% rise in engagement compared to those uploaded at noon or at midnight. Your post will remain much-loved after such burst of engagement. Moreover, it will maximize its visibility and prolong its lifecycle which in its tu will give you more comments. Another way is to provide content that will evoke reaction. There are certain kind of posts that will inevitably induce reaction from Instagram users. It is strategically wise to make up posts that users cannot help commenting. Such posts are usually emotional, touchy-feely and even incendiary. You will get better effect if the posts are connected to some particular well-known events.A reliable method to get a number of comments would be to develop the comment already made on the post. This tactic may provoke hot discussions, and, consequently, more comments. If you long for some public recognition, in the end, you can promote it and boost your Instagram account.